If you’re not familiar with Google Cardboard, it’s one of the most affordable and portable VR headsets to date. It’s a very simple creation in terms of design and functionality, but provides a solid look into the future of technology without breaking the bank. Why? Because it’s made almost entirely of cardboard. Recently, I came across an article on CNET that showcased a group of iOS apps that are compatible with Cardboard. These apps weren’t actually designed with Cardboard in mind, but they were made to work with VR headsets (stereoscopic content), specifically the Durovis Dive, which is essentially a premium version of Cardboard that was announced back in January at CES 2014. All of this hardware is aimed at developers, but as more start creating new apps, consumers will be able to benefit from VR hardware (or “cardware” as I like to call it) as well. Virtually any iOS app that was designed to work with the Durovis Dive will work with Google Cardboard. There are only about five apps worth checking out at this point, but as the demand rises I’m sure other developers will jump on board and craft better VR experience apps. The best way to find compatible apps at the moment is by searching for “Durovis” or “Durovis Dive” on the App Store. Either of those terms will pull up a variety of apps that were designed to work with VR headsets. Dive City Coaster – Roller coaster simulator. The Height – Simple VR demo/game. Dive Zombie – Shoot zombies in virtual reality. Moorente – Like Duck Hunt for VR headsets. Stereoscopic Tunnel Effect – A never-ending journey through a virtual tunnel. 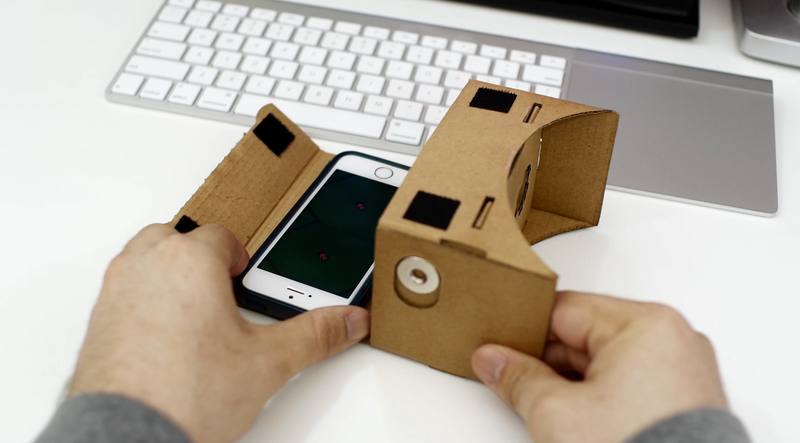 Unfortunately, Google doesn’t actually sell Cardboard. There are official instructions to build your own Cardboard headset, but if you don’t feel like going that route, there are plenty of unofficial Cardboard kits available on Amazon starting at $19.99. It’s also important to note that this will work best when using an iPhone/iPod touch with 4-inch (or larger?) display. Because of the size difference between the iPhone 5/5s and most Android devices (hopefully this will change soon), the iPhone will slip and slide around inside of Cardboard unless you use a case, but that’s not a big deal in my opinion. Other than that, I found the iPhone and Cardboard virtual reality experience to be very comparable to an Android device. The only thing you’re really missing out on is Google’s official Cardboard app, but that’s really just a collection of stereoscopic demos thrown together. It’s best to put the iPhone/iPod touch inside of a case when using Cardboard. Do you need this? Not really, but it sure is a fun experience. It also gives Facebook’s Oculus Rift a run for its money, though Cardboard isn’t quite at that level of gaming just yet. Even so, with VR technology on the rise, do you think it would be important for Apple to make a move in this area? It’s obvious that developers have a slight interest in virtual reality on iOS, but until Apple makes a move (if they ever do), Google Cardboard is the best and most affordable way to experience this on an iOS device.